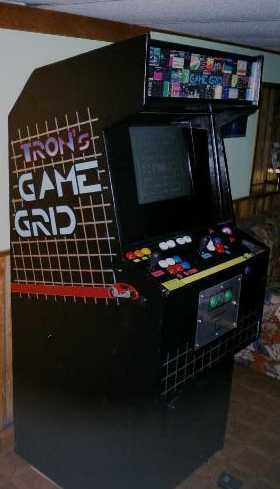 TRON's Game Grid: Building a Home Arcade Machine! The Golden Age Lives On! Pacman hit my college dorm in 1980. Suddenly, there was Defender, Jungle King, Targ, and Missile Command! Quarters became an endangered species. The Arcade Age had arrived! Ah, the Golden Years! I could recount more about my arcade loves than my human ones. The thrill of Crush Roller, the low rumble of atomic destruction in Missile Command, the sheer giddy simplicity of Bandido! I went through a fortune in quarters, standing in Myles' Pub or Noah's Arkade, playing Frogger until my knuckles were sore. But one day, I woke up on the street corner, out of quarters and out of luck. Where were the arcades? Alas, the end of the era of the blinking game machine came with a whimper, not a bang. Bit by bit, the arcades disappeared, as they were supplanted by jerky little low-res video game consoles for the home. Still later, PC's came into their prime, and the last sad arcade machines were demoted to seedy strip malls, or left for dead on their sides in some waterlogged junkyard. A sad death for the once great. R.I.P. I got into the Net in 1999, and began hopping the fast train to Cyberworld. ("Hey, look, I'm in Scotland! Now I'm in Peoria!") Jeez, everything, good and bad, is out there. (Check my Links page.) And I began to hear about something called MAME; that's short for the "Multiple Arcade Machine Emulator", a fan-driven non-profit project to save all those arcade games we loved as kids. The machines are dying, folks, as dead as dodos or raptors, and MAME is a project to take the ROM images from all those old machines and let them live again! It's all about "emulation." (For the Newbie, that's convincing your big, fancy Celron 333 with the 32M memory to behave like a clunky old arcade machine.) And with it, Mappy bounces once more, the Invaders thunder overhead, and that old boy PacMan chugs along eating up dots just like it was 1983. The sad thing is, the original owners on most of the games of our youth are long gone, and have done nothing with the games for over twenty years. MAME puts the paddles of life to those games, and brings them back on hardware you probably own already. DISCLAIMER:I am in favor of using MAME to save all the abandoned games that would be lost to the ages, but you also should really support the few vendors that still support their games. Microsoft sells several old ATARI games under their "Revenge of Arcade" line (Pacman and some others) and Williams, of Moon Patrol and Defender fame, also offers Williams Arcade Classics. Both are damn near impossible to find, but do try your local K-Mart or computer store. Buy them outright if you can...and then play what's left on MAME. A "stand-alone" arcade box was the next logical step. Some hobbyists out there will surf for actual used arcade boxes, buying them for $25-$100 and spending ten times that much to get picture perfect decals, glass and trim off of Ebay. (I used to think the people that restored classic cars were nuts before I mixed with Arcade enthusiasts!) But the real challenge would be to build a machine from the ground up...to do the art, do the wiring, do the whole shebang. Thus was born "TRON's Game Grid." I studied about twenty classic games on various websites before I decided that the bare bones of the Grid had to be the case from Defender, the multi-button screaming classic. I found the dimensions of a Defender box here, and started planning. The case itself is made from 3/4" plywood, with the computer stored behind the fold-down "coinbox". The computer is a Celron 333 with 32Meg in a used case; I picked up the motherboard/ CPU for about $125 on the net. The monitor was the most expensive part of the project, 19" hi-res color beauty that often outshines the original games. The video card is a vanilla cheapie; I don't play the 3d games of today on my arcade box, and it kept the overall cost of the project down. But the thing that makes the years roll back is the control panel! To the left you can see inside the main bay. The left joystick and the buttons are hardwired into into the backside of an old computer keyboard, the kind that had actual solder connections, and real switches in the keys. Some dedicated gamers dispense with the keyboard itself, and wire directly into the "matrix", the little brain in the keyboard. My design lets me do set-up work on the computer with the case panel down, and then close up for gameplay. 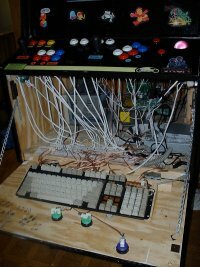 Before you attempt a project like this, you should know about Happs Controls, an electronics company that makes the replacement joysticks and buttons for fixing what's left of the world's arcade machines, and that they will sell to YOU if you have a business address and $25.00 worth of orders. A great site to visit as you study controls is the "Build Your Own Arcade Controls" site, with info on every aspect of building control panels. I studied another dozen home-brew machines to find the control panel layout I liked best, and ended up with one of my own, which allows most arcade games to run easily. Each of two players runs a six- button/one-joystick array, and the two sticks in tandem make for realistic Battle Zone! The center stick cluster is labeled "TRON" and is Player One. The center joystick is wired into a cheap six-button gamepad to hold down "ghosting" problems (where too many keyboard keys being pressed at one time produce odd results.) Each cluster's two red buttons are "A" and "B", the traditional buttons for old arcade games.The left cluster is labeled "MCP" and is Player Two, with that joystick wired to the "arrow keys". 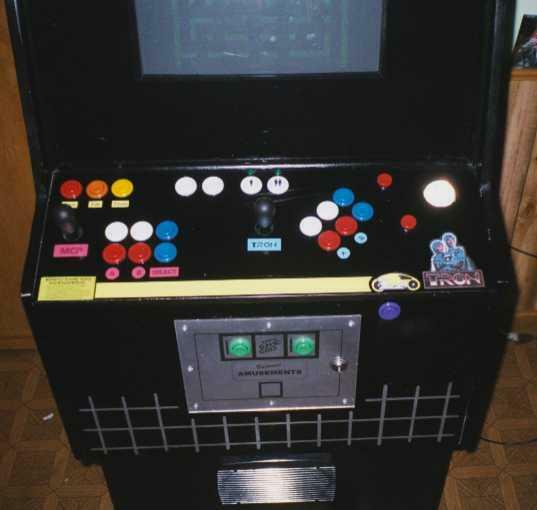 That stick controls the up/down game selector function of the Arcade At Home menu program, with the closest left blue button wired to <Enter> for initializing the chosen game. You "coin up" with the green buttons on the coinbox front, and choose number of players with the white ones in the center of the panel. Some MAME games actually flash the keyboard's "CapLock" and "NumLock" LED's to indicate one and two player credits, so those lines were run from the keyboard to indicator lights over the one and two player buttons. Upper-left three button cluster are MAME housekeeping functions; <ESC> to break out of games, <Tab> for internal game specs, and <P> for MAME's pause function, a great feature when it's time for dinner and you just hit 1,000,000 on Defender! 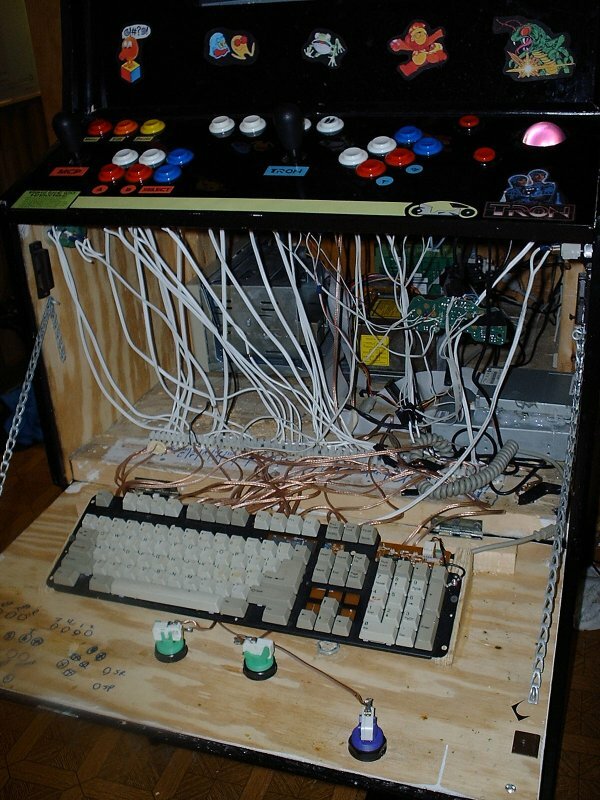 I also wired in a footpedel tied to the "up arrow" key on the keyboard for racing games, and there is even a "plunger" button on the case front for pinball games! Tron, that old Disney warhorse, seemed a perfect theme; nobody else had used it yet, and it was SO 80's. So I scoured the Internet for artwork, finding a whopping 2,282 hits from people who were as obsessed as myself with the old "inside the computer" movie. Control panel art was printed on white acidless stock with a Cannon BJC-4000 inkjet printer, and placed under the clear panel to show through. The side art I hand-painted myself, evoking the "Lightcycle" from the movie, with the front wheel being one of the two "flipper" buttons used in pinball-type games. A second black button is ahead of this cycle, and is wired to the <spacebar> for the "TILT" function in video pinball! The marquee is an altered version of a three-panel .jpg file available in whopping full size right here, or you can preview a small pic of the original file here. It was originally made by Corey Vigen, and I give him the credit for the original design. I tried several kinds of media, and settled on bright white acidless glossy paper printed full color on the same high-res color inkjet. The 3 panels are mounted between two sheets of Plexiglas and lit from behind by a low-output 10" fluorescent tube. I didn't want to spend $100 on a real coinbox (and I wanted the space it would take for the PC) so I created one of my own. I spray-painted a metallic silver rectangle on the box front, and used special black-and-clear line art reproduced on a transparency ("Bartmess Amusements!) over that. The panel is finished with a sheet of clear 1/8" Plexiglas, held in place by real metal screws. Two green Happs pushbuttons allow the gamer to "enter coins" into the machine with the touch of a button. For the Win98 interface, I found a TRON desktop theme that worked nicely on the machine, located a a dynamite TRON screensaver, and created some startup/shutdown screens from art I found on the Net. If you consider doing your own MAME box, you will want to visit the Eyecandy section of the Downloads at the above mentioned Controls site, where all these goodies, and a lot more, reside. To really do the Grid justice, I included a $39.95 stereo speaker/subwoofer set, mounting the two speakers up at head level in the case, and the woofer down low. It cranks! But with all that power, there should be more we can do with it! You bet! If you love oldies, and own a collection of CD's, there's yet another cool thing you can do with a MAME box: put a BIG HONKING hard drive in it, and make it the jukebox you've always wanted! The program you need is called MusicMatch Jukebox, and it plays those cool new MP3 files in clean, digital stereo. Once you install the program, it is configurable to a dozen different interfaces, from classy modern blue fluorescent to 50's diner Retro Chrome. And to convert your own CD collection is simple: pop that 50's Doowop CD in your drive, and tell MusicMatch to get to it. Come back in 30 minutes, and you have clean MP3's stored on your hard drive. My box is full of classic Sinatra, bagpipes, and They Might Be Giants! It is worth noting that you can use Itunes or some more complex music player on your arcade, but Musicmatch is simpler for the novice and although it was sold to Yahoo and is no longer being updated, the link here will take you to somewhere you can still get it. The program also features a neat graphics window to show the album cover of whatever is playing. You can go to amazon.com and capture the album graphics with your browser. Total cost of the project was probably about $600, but that included a $350 19" monitor. (Remember those prices?) A quality 17" might have been just as good, as some of the old classics are fairly chunky when blown up this big. The Celron 333 does a good job running all of the MAME games I have tried, and I have seen a machine as slow as a Pentium 233 do a pretty good job of the main 200 or so original games. MAME will support most joysticks, so you might get by using your own main computer. But if you can afford it, dive in! Some guys solve their mid-life crisis with a red sports car. For me, the way to bring back the days of my youth is to hit the basement and visit the old neighborhood arcade. There is nothing like punching a credit on your own gamebox, and blasting a few Space Invaders. Oh, and if you want to see dozens of other cases, visit Arcade At Home and go to the "Cabinet Pics" section. Some fans (like me!) even make oversized control panels for four-player action, so even the Big Boys like Gauntlet can live again. (Hey, those other people who own MAME boxes are crazy! :) Check 'em out, and see you in the arcade! URL: http://www.yestercade.net/console/arcade.htm Love That Email!